As a history buff and an avid animal lover-advocate, I can’t help but do a little dance when these two interests come together in a historical picture book for kids. I’ve reviewed others that have told history from an animal companion’s perspective or with animals at least heavily featured, including Emily Dickinson and her dog Carlo and Lewis & Clark and their canine friend Seaman. We three must remain friends in order to ensure happy homes in all countries. 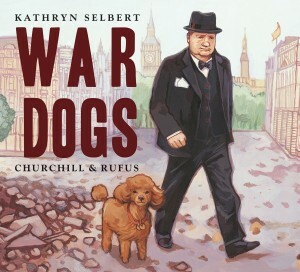 Although Selbert did not dive into the reasons for the war and some of the more intricate, yet important details, she does provide an informative timeline for older audiences, a small essay on Churchill and his affinity for animals, including cats and chickens, and another essay on Winston himself. War Dogs is a great addition to this growing body of kid lit. A review copy was provided by the publisher, which also offers a free discussion guide to the book.